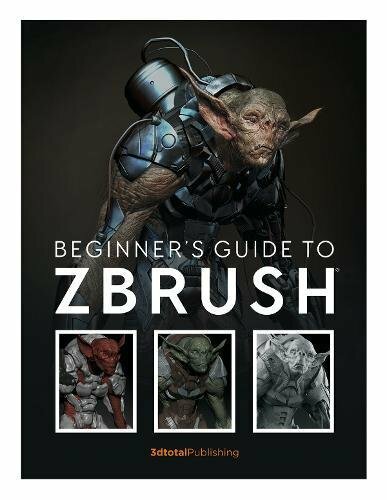 Once again, 3dtotal Publishing has put out a comprehensive instructional book, this time for Zbrush. This 272-page paperback is a detailed guide written for beginners who want to learn sculpting with Zbrush. The book starts off with a guide to the user interface, features and possibilities, then moves on to the step by step tutorials which form the bulk of the book. You'll learn organic sculpting, mixed-surface sculpting, hard-surface sculpting, rendering with KeyShot, and there's even a bonus chapter on 3D printing. It goes without saying that you will need Zbrush and Keyshot software in order to follow along with the lessons. ZBrush currently offers a 45-day free trial without restriction and KeyShot's trial has no restrictions as well, but the rendered images are watermarked. Each tutorial featured are long, comprehensive and hands-on so they will definitely require your full involvement. The software is best learned by practising and that's what this book is good at, getting you to learn by doing, by sculpting. The instructions are easy to follow and there are plenty of screenshots showing the steps. There are many tips and techniques you can learn along the way. You can certainly find free ZBrush tutorials on Youtube, but it's way more convenient to have a structured learning process that goes through everything from basics to advanced features of the software, all in one place in this book. Oh, for the last chapter on 3D printing (6 pages only), if you want to follow along, you will need a 3D printer. The one used in the book is Formlabs' Form 2, and SLA printer. This is a fantastic guide for ZBrush beginners. It will get you up to speed with sculpting, and knowing the ins and outs of the software quickly. Thanks for this review. Oddly enough there are no reviews on Amazon at this time for the product, and while 30 bucks isn't a lot, I didn't want to just throw it away on a book that wasn't going to teach me anything. Btw. Used your link to order.